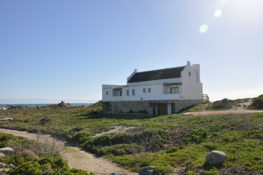 Dunstone Beach House is located in Jacobs Bay on the West Coast. 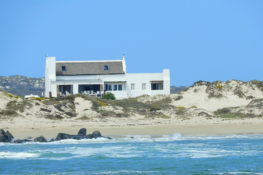 Positioned less than 50m from the water’s edge and just a few steps from the long, soft sandy beach, this magnificent location offers you the perfect chance to fall asleep with the sounds of the waves crashing on the shore. 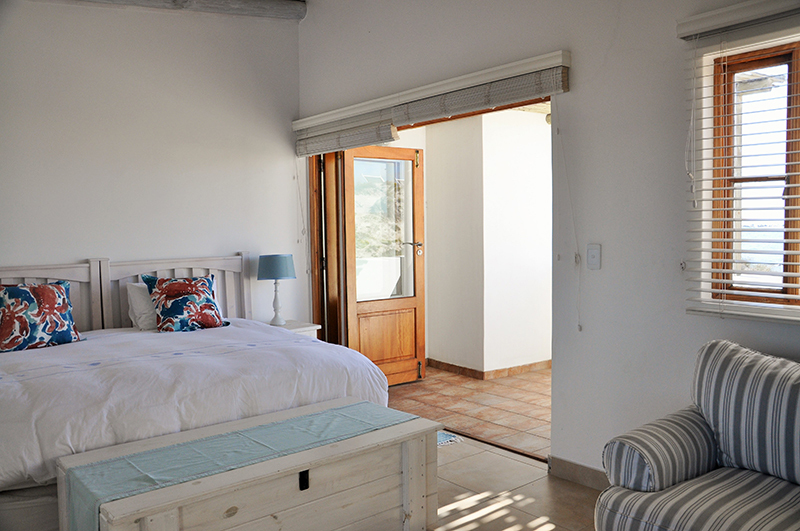 Our self-catering house has been designed to fully appreciate the location, with full length sliding glass doors leading out onto a sun deck, and then immediately onto the beach. 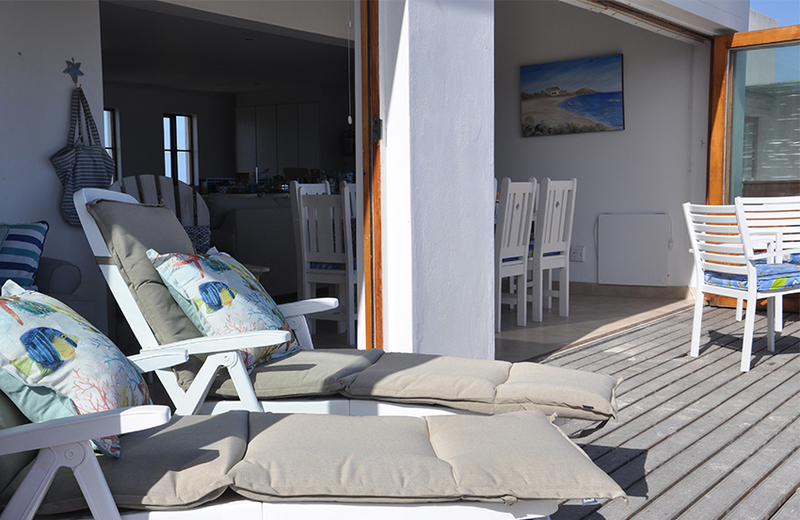 From the bedrooms to the living area, the entire house opens up giving direct access to decking and the dunes. It is ideally situated at the end of the peninsula, overlooking Hospital Bay – a long wide sandy beach. 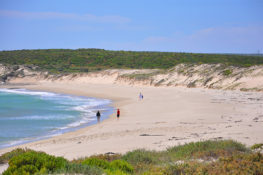 Perfect for taking long walks, it is also safe for children and dogs to play. 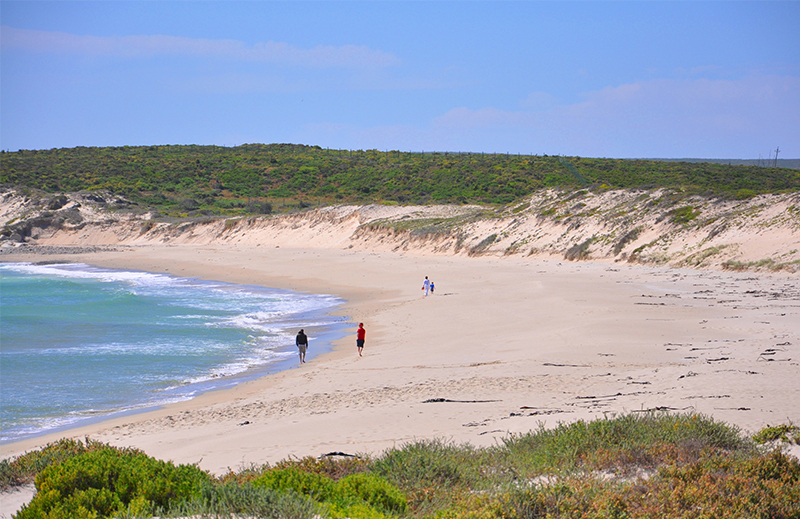 The sea is equally safe for swimming and body surfing and if you are lucky you may get to watch dolphins playing in the surf; just beware – the ocean is a little cold! 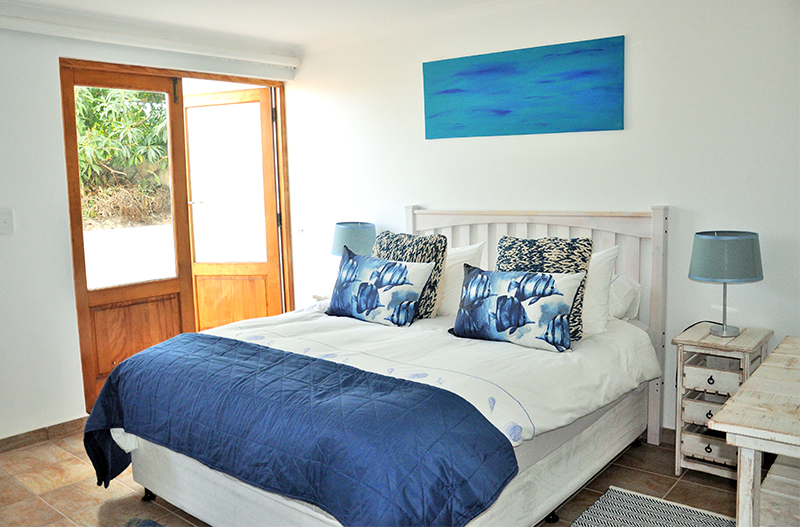 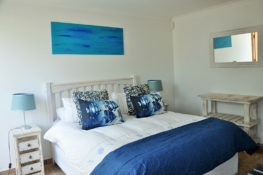 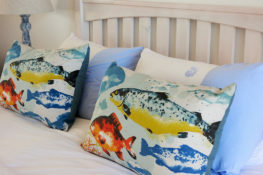 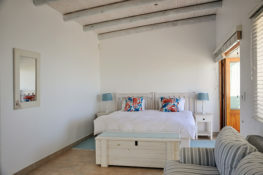 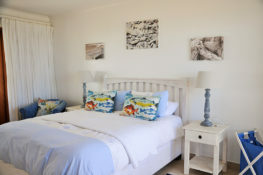 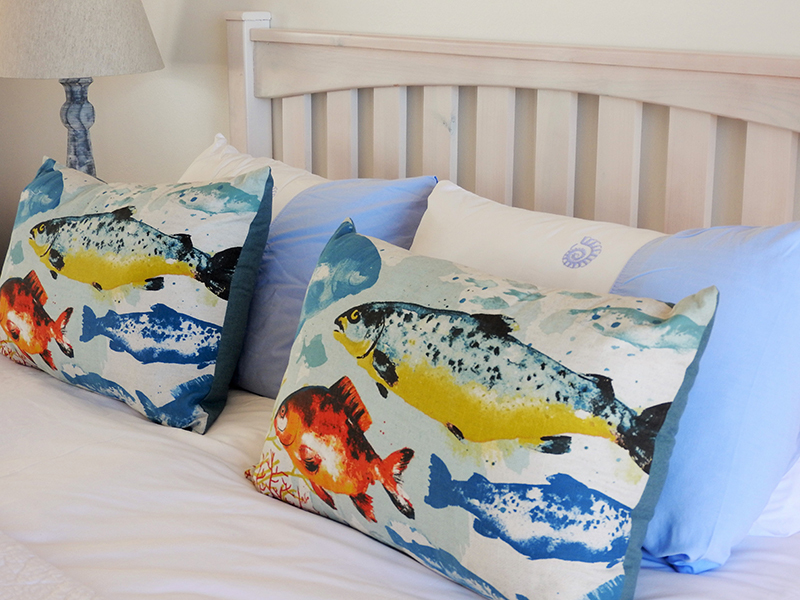 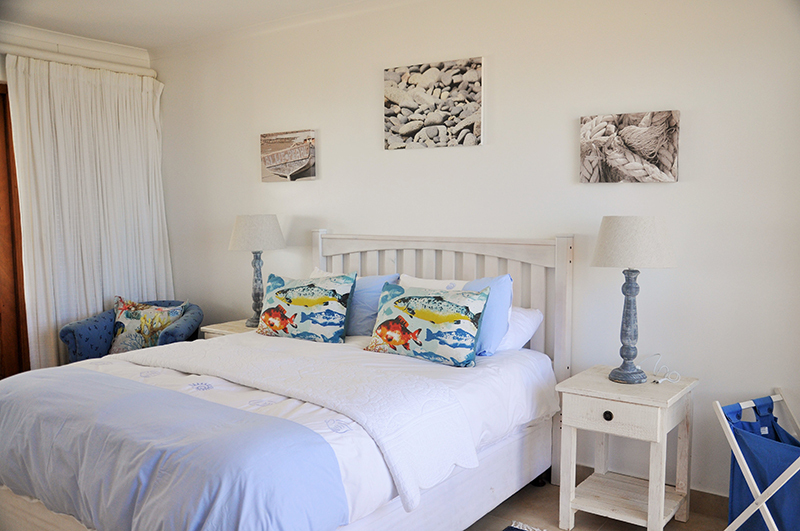 With 4 large en suite bedrooms, Dunstone Beach House sleeps 8 adults comfortably, or 6 adults and children. 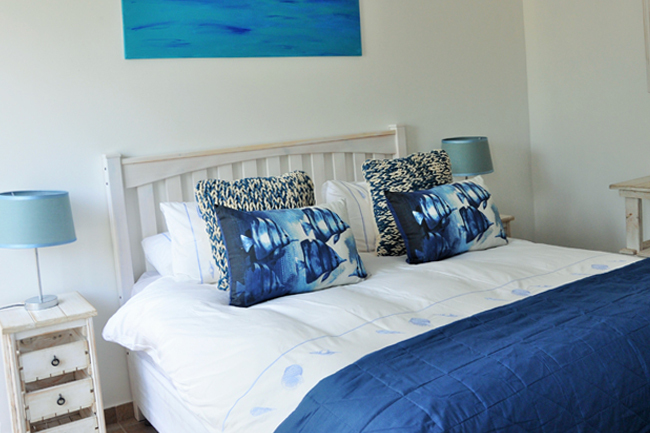 Additional children can be accommodated on mattresses – please enquire. 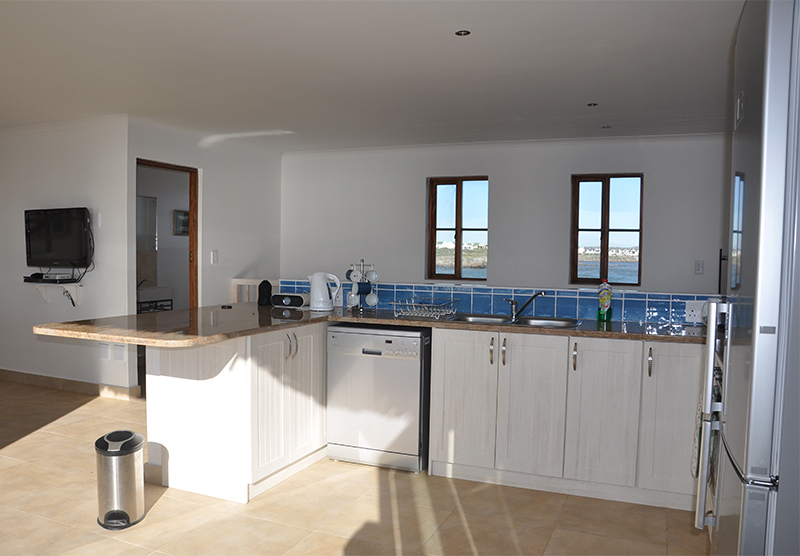 The main level has a fully equipped open plan kitchen, lounge and dining area which lead onto the deck overlooking the sea. 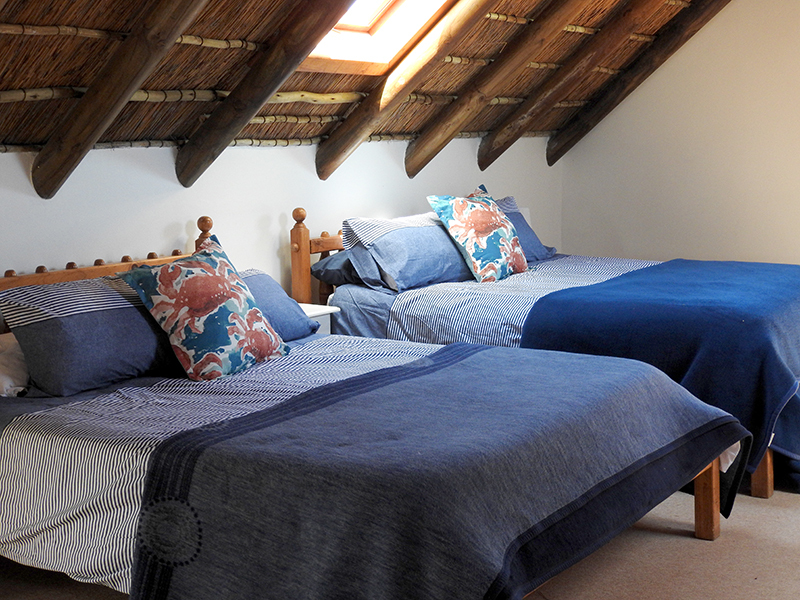 In addition to this, there is a indoor braai area and comfy seating, and a TV lounge with full DSTV and DVD player. 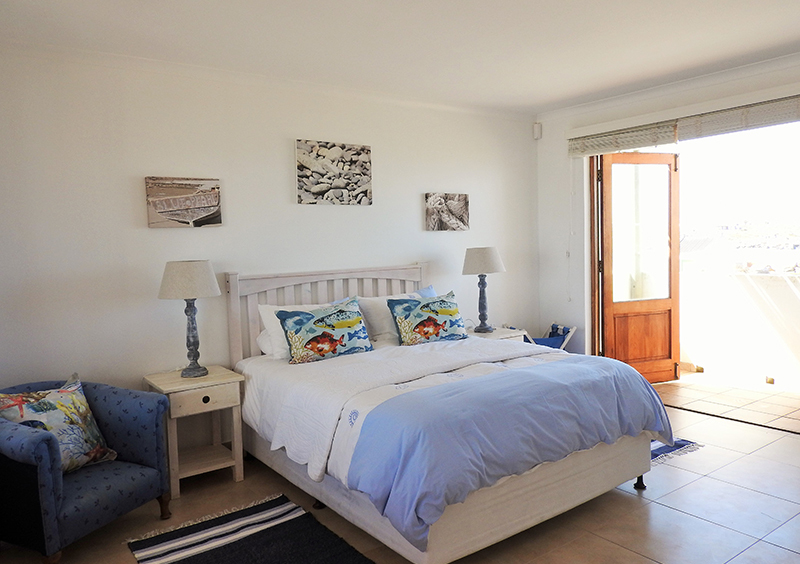 The lower level downstairs has a large entertainment room with comfy sofas and bean bags and a large 55 inch TV with separate full DSTV and DVD, mini kitchenette with electric oven, fridge, freezer, and additional kitchen. 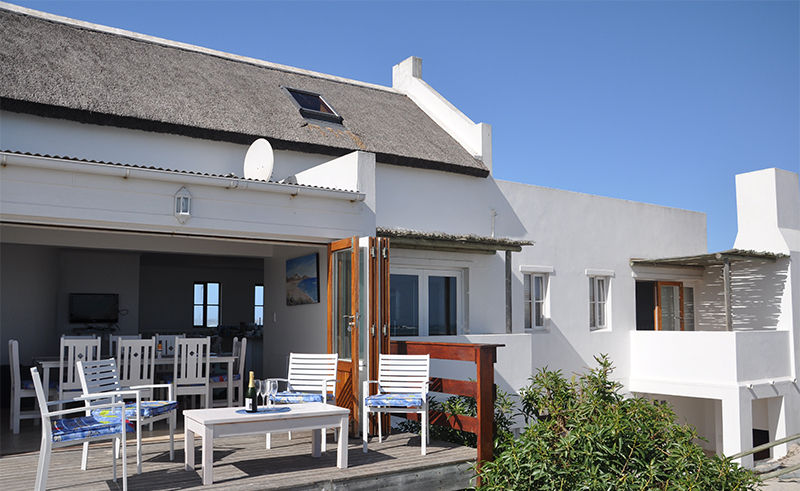 This level also has a large sheltered outdoor braai with chimney. 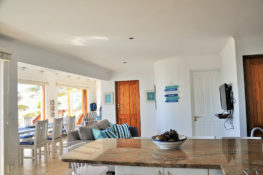 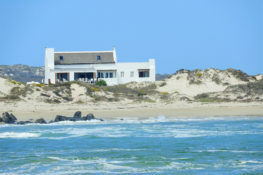 Dunstone Beach House is perfect for entertaining, relaxing and enjoying beach life at its best. 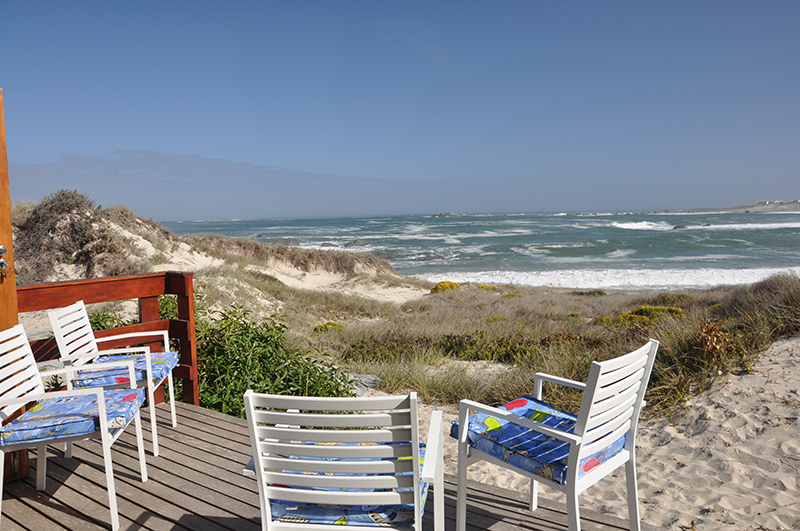 Please note: if you wish to braai/barbecue please bring your own grate. 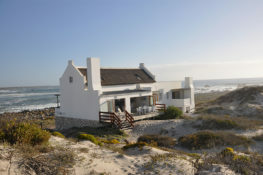 Furthermore, there is no Wifi, so please bring your own dongle if you need to connect. 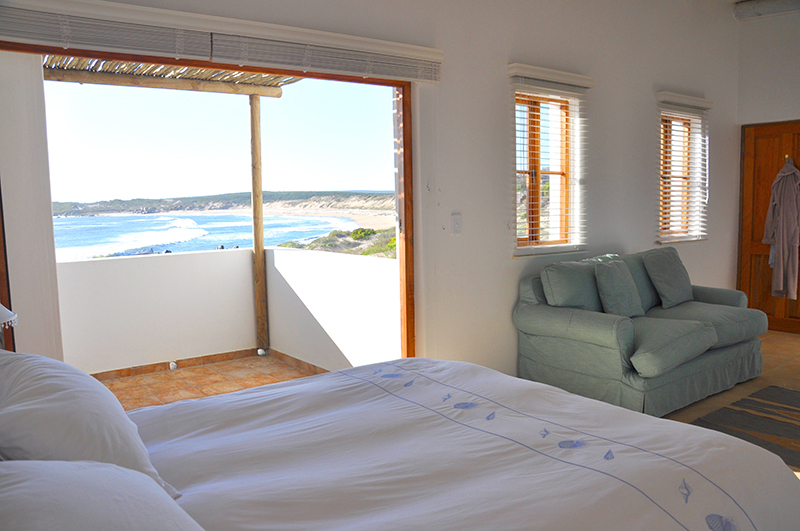 There are beautiful views from every room of the house. Two bedrooms are located off the main level living area. 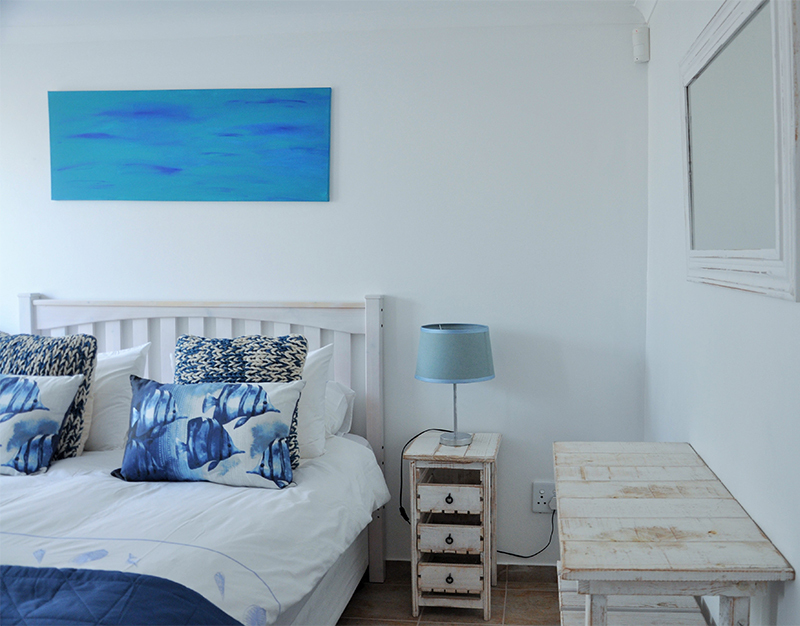 The third bedroom is a situated downstairs, off the entertainment room. 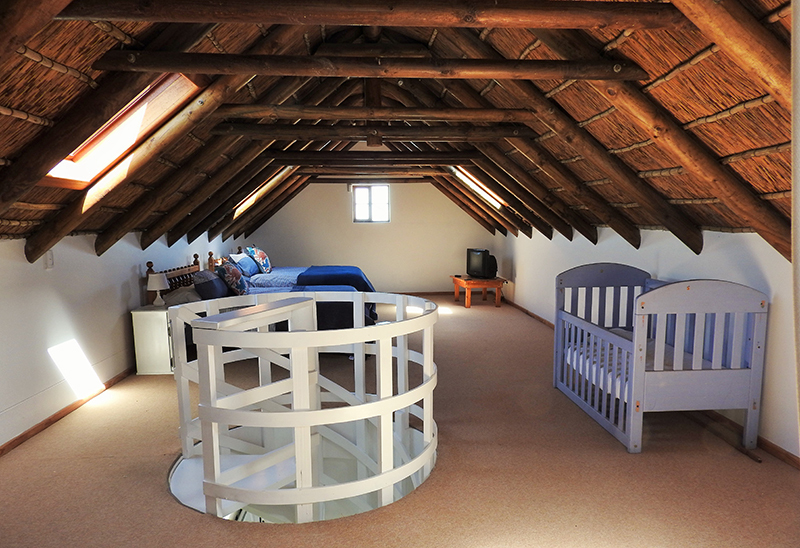 The loft room is tastefully furnished and located up a spiral staircase – this room makes the ideal kids’ dens. 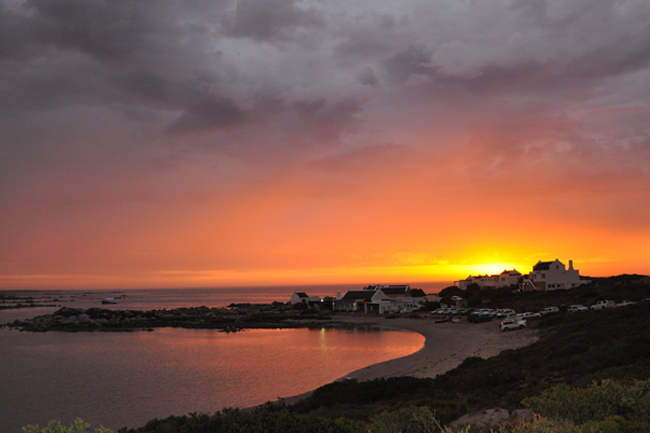 Jacobs Bay is a traditional west coast little fishing village with white washed homes and is the perfect place to fish, dive, sail, go for long scenic walks or just to chill on the sandy shores. 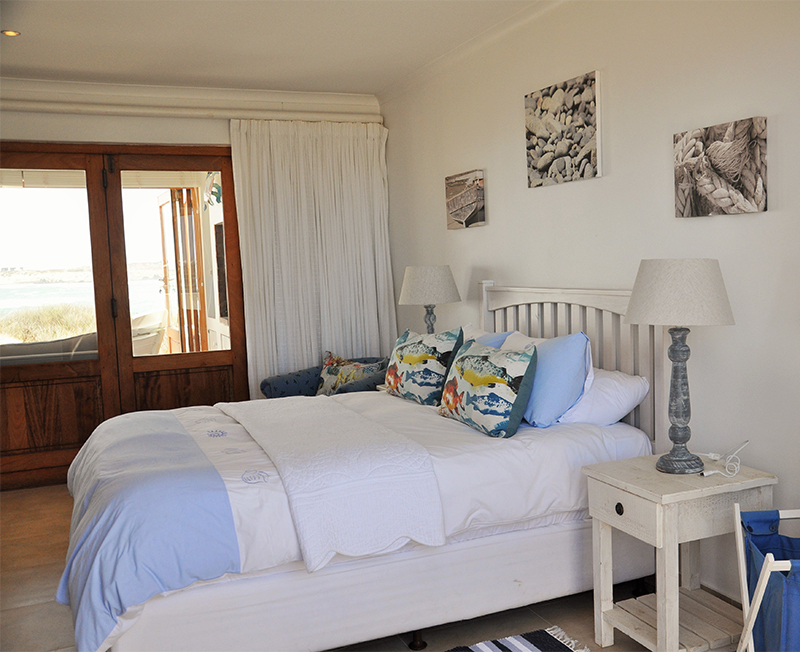 Dunstone Beach House is just one of the beautiful accommodation options that fall under the Dunstone Collection. 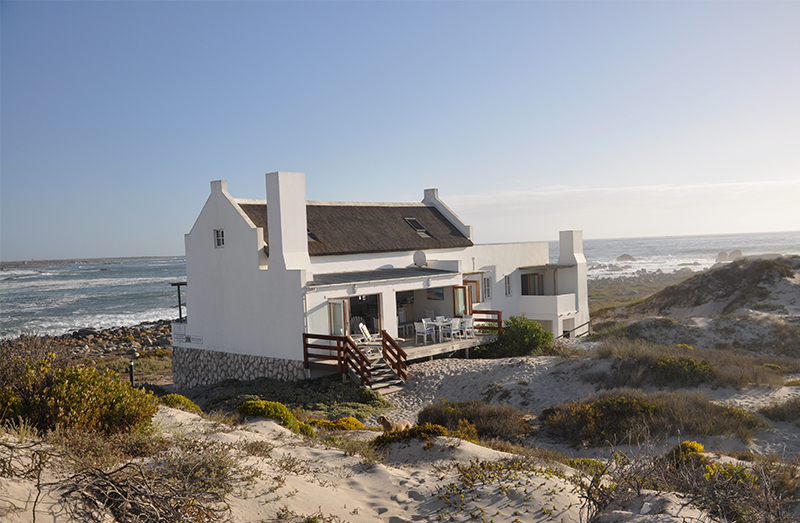 For an escape to the Cape Winelands, be sure to visit our luxury guesthouse and B&B accommodation, Dunstone Country Estate. 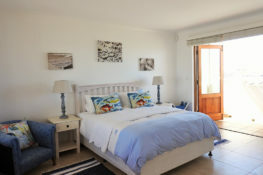 The main bedroom has large sliding doors leading onto a private balcony overlooking the beach and sea, as well as a 2nd private balcony with double doors overlooking the sea and village. 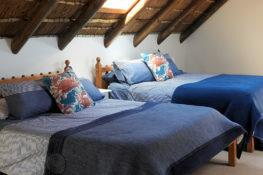 Furnished with a King sized bed (or twin) with fine cotton linen, goose down duvet and pillows. 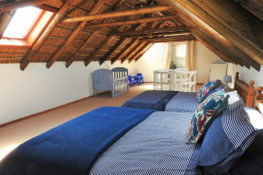 It as a flat screen TV with full DSTV, and DVD player with USB. 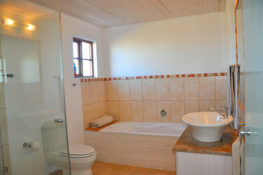 It includes a sofa to relax and a full en-suite bathroom with large shower and separate bath. 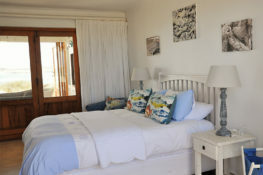 The second bedroom has a private balcony with double doors overlooking the sea and village. Furnished with a Queen sized bed with fine cotton linen, goose down duvet and pillows. 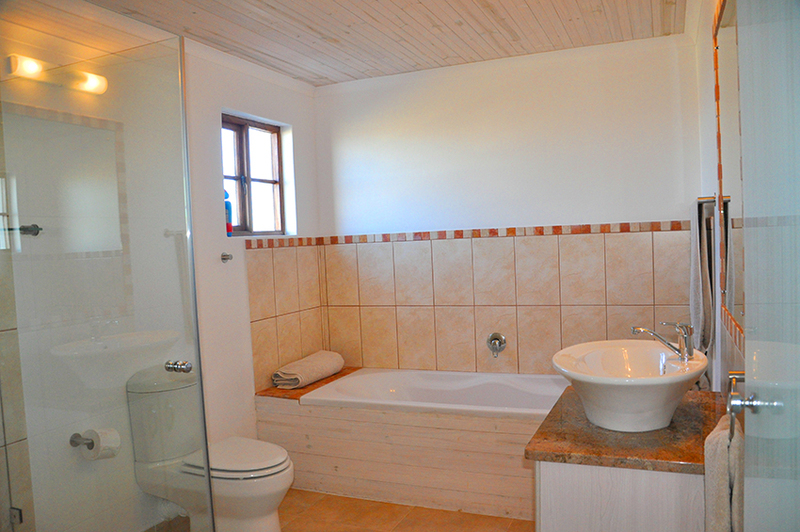 There is a full en-suite bathroom with large shower and separate bath. 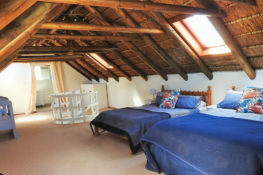 Bedroom 3 is situated on the lower level off the entertainment room. The bedroom is furnished with a queen sized bed and doors opening out to sun area and dunes. 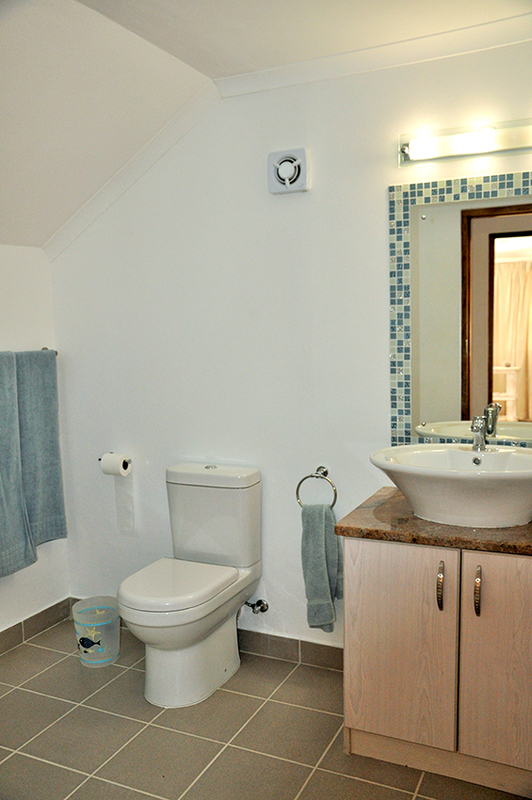 There is a large shower bathroom just across the corridor. 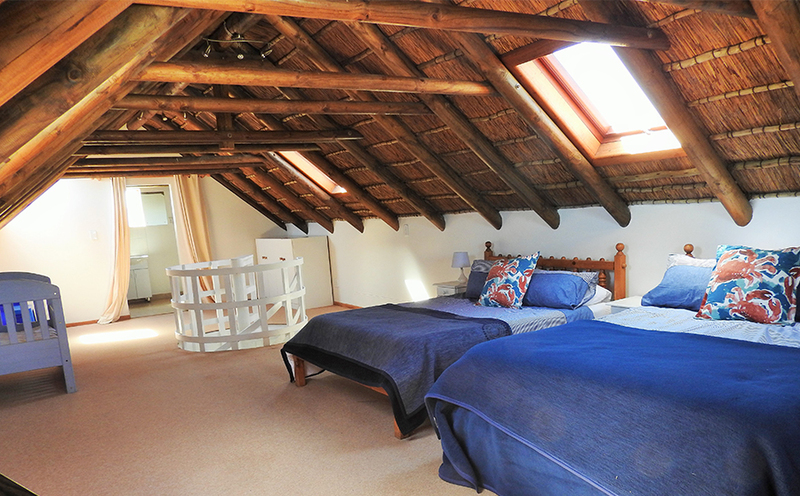 The thatched loft is an open plan large relaxed bedroom ideal for kids, a couple or a couple with kids. 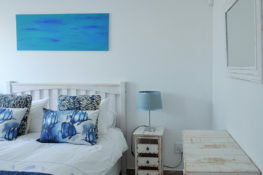 Complete with ensuite shower room, it contains 2 x queen sized beds and a large baby/ toddler cot (please note the cot cannot be moved downstairs). 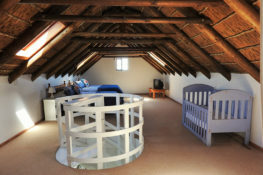 The loft room is reached by a spiral stairwell. Kids love this space and there is also a TV for watching DVDs. 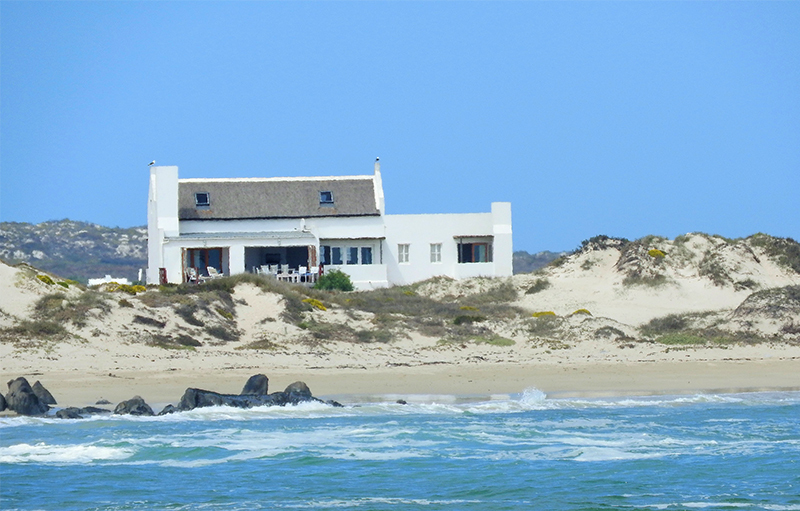 Dunstone Beach House is set on the dunes of Jacob’s Bay, just 50 m from the shoreline. It offers uninterrupted views form every room. 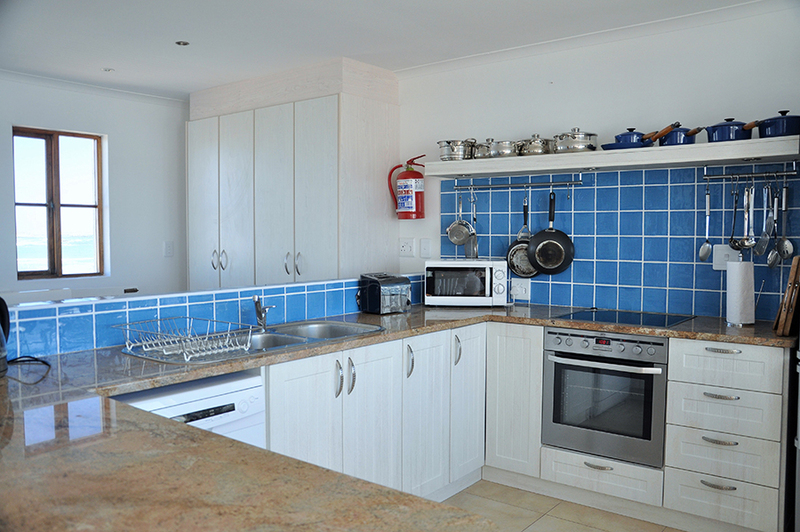 The house has a fully equipped kitchen. 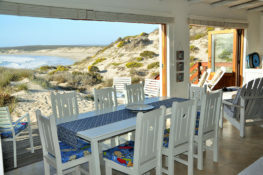 The dining area leads to the deck and covered patio which has a built in braai/barbecue. 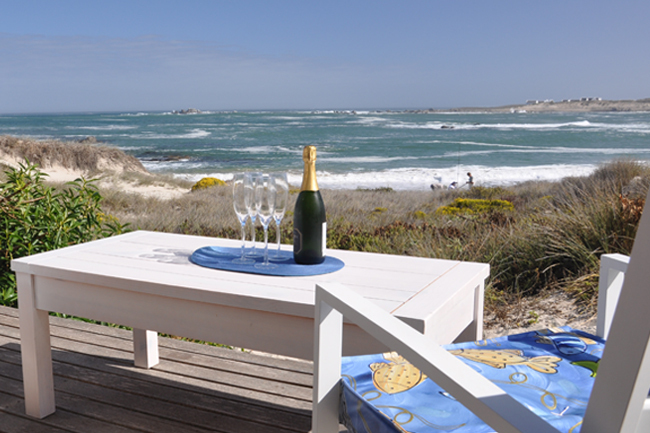 Please bring your own braai grate with you. The deck is furnished with chairs and sun lounges. 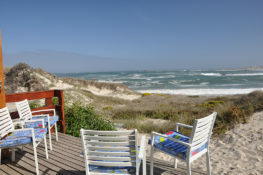 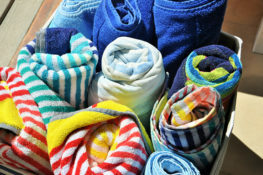 Cushions and beach towels are included, as well as a few toys for children to play in the sand. 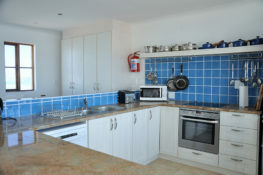 Serviced once a week – for addtional cleaning at extra cost please enquire. 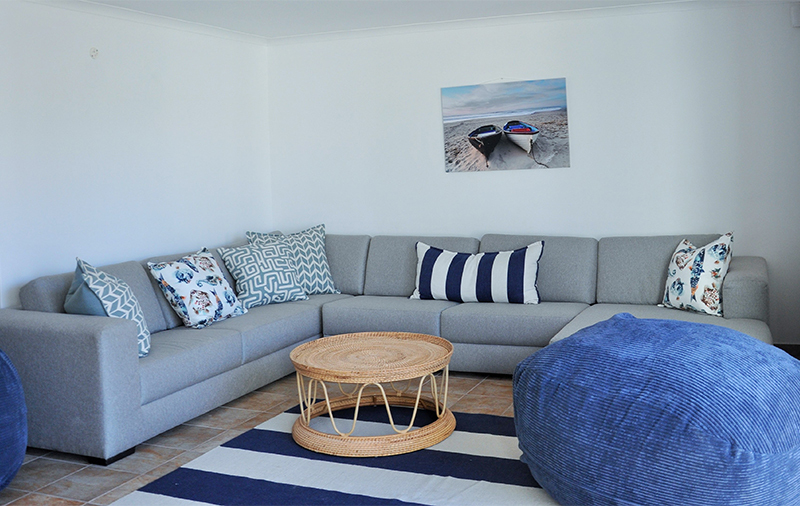 Large lounge area downstairs with 55 inch flat screen TV with full separate DSTV and DVD player, large sofa and bean bags. 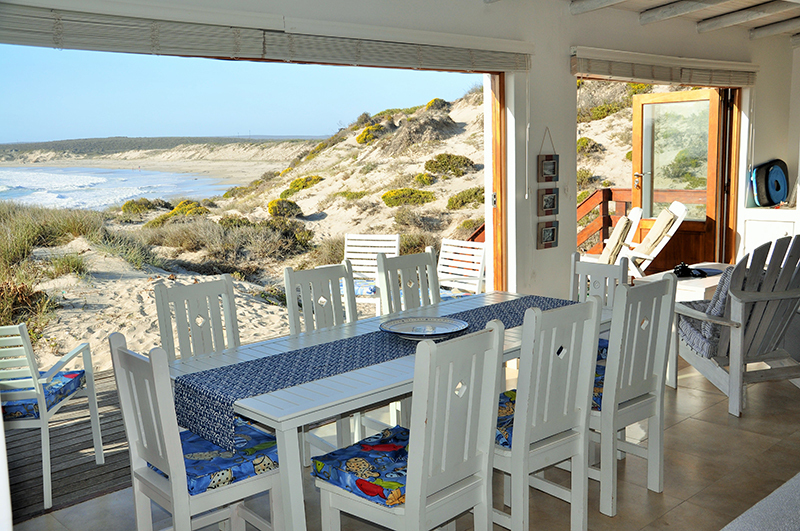 Indoor braai area with folding doors opening onto the wooden deck and views of the sea – please bring your own braai grate with you. 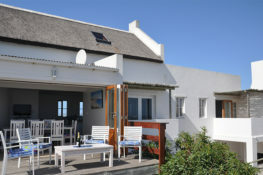 Large outdoor sheltered braai area with chimney, in view of large screen TV. 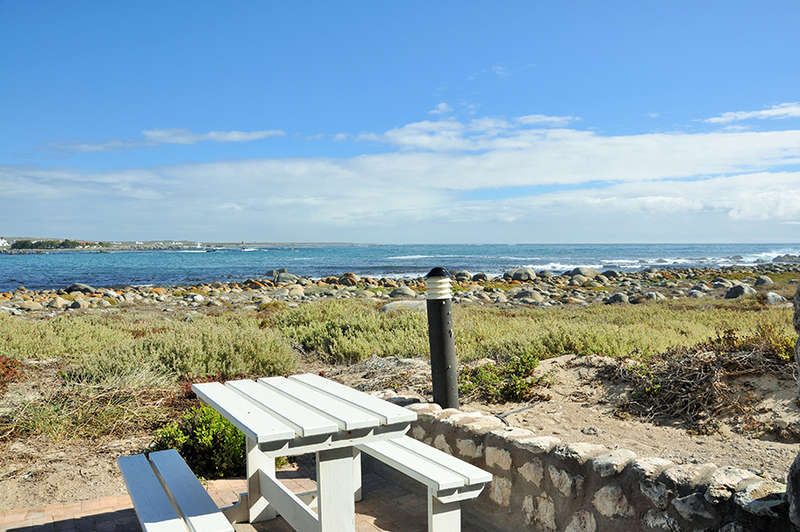 – please bring your own braai grate with you. 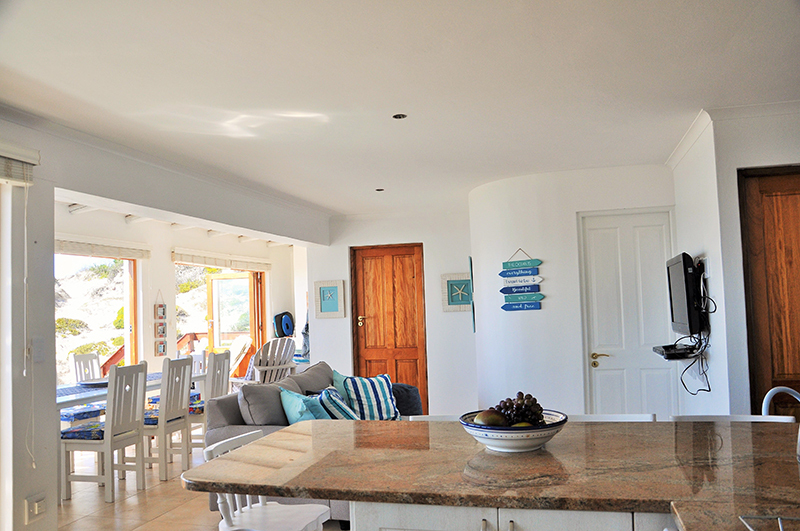 Kiddie gate on the main stair well. 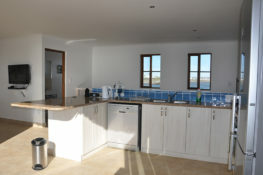 Utility room with washing Machine, tumble dryer and ironing board. 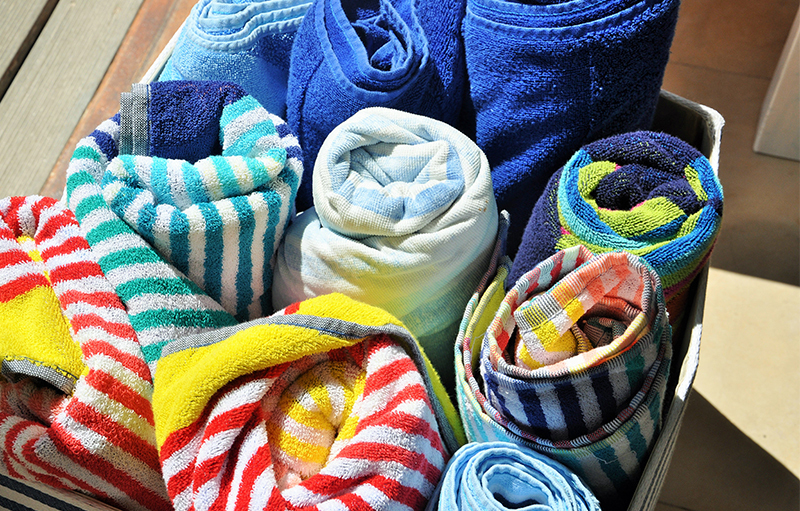 Beach towels and kiddies beach toys provided. 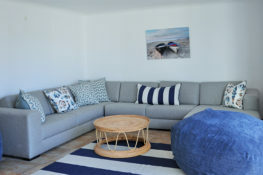 We do not provide internet – please bring your own dongle to connect. 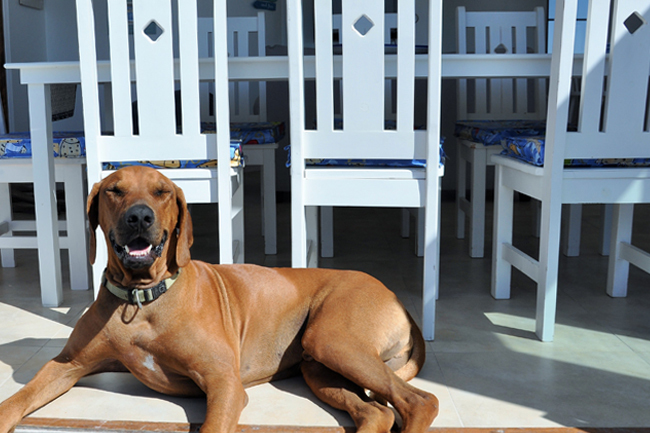 Children and dogs are welcome, please let us know when booking.